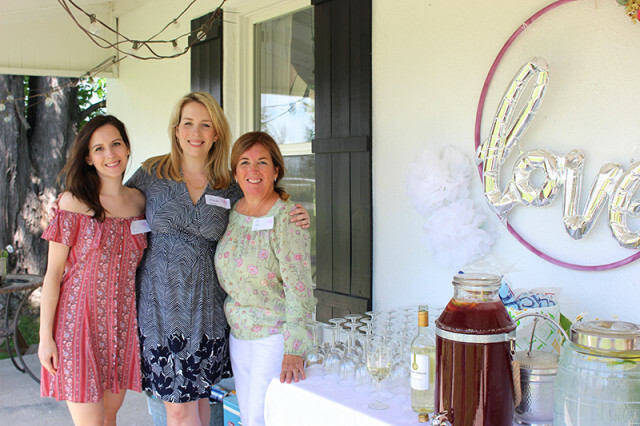 Earlier this month, we had a bridal shower to celebrate the upcoming wedding of my cousin. 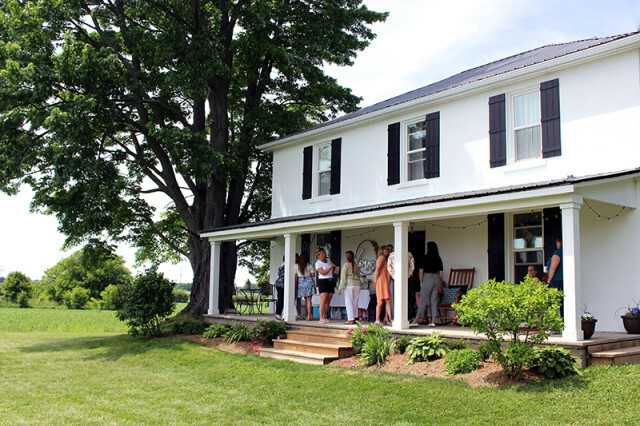 I love living in our farmhouse, but I especially enjoy when we get to open the doors and welcome other people here too. We couldn’t have asked for better weather and it turned out to be a great spring day. 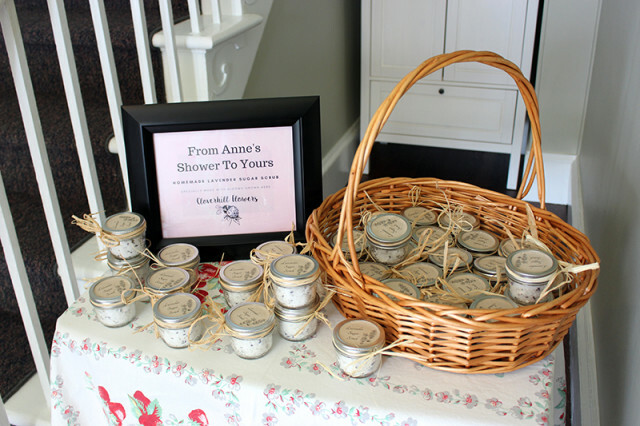 I hosted the shower along with aunts and fellow cousins (including my mother and sister here). 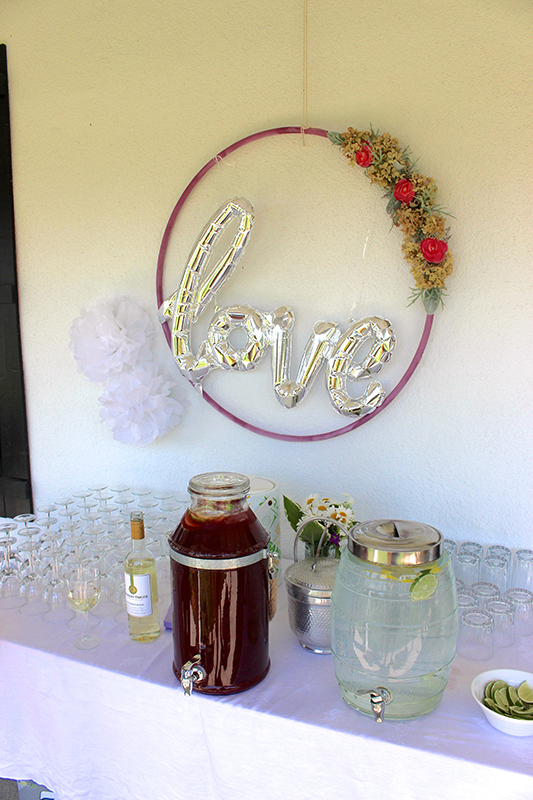 We had a great time coming up with a menu, games, and decorations, including this cute bar on the front porch. We spray painted a hula hoop, then hot glued on dried and silk flowers. The “love” balloon was a last minute find on my visit to Target during our Pennsylvania road trip last month. We had two big drink dispensers – one with a non-alcoholic punch and the other with lemon-lime fresh water. We also had an array of pops, as well as wine for making spritzers. 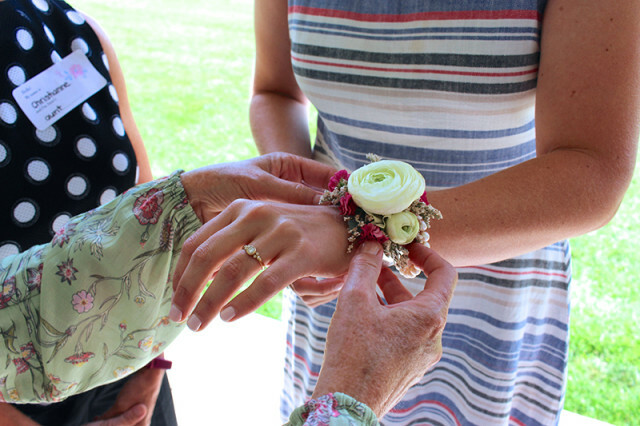 My mother and I are doing the wedding flowers, with blooms we grow for Cloverhill Flowers, and she put together this sweet corsage for the bride. The ranuculus was picked up at a local store, but everything else we’ve been able to grow in our own field so far this year. 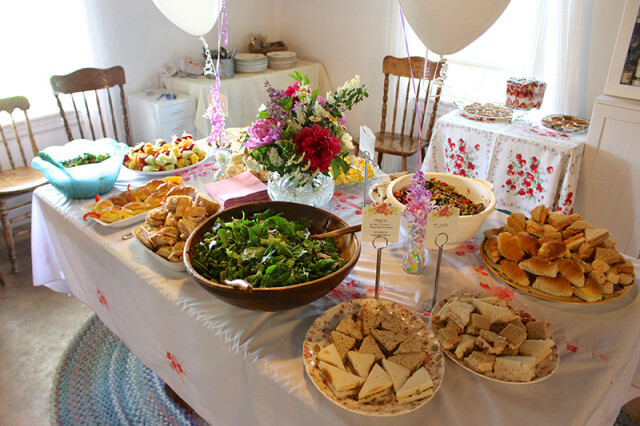 We set up the dining room for our luncheon buffet, with a large variety of goodies for everyone to enjoy. 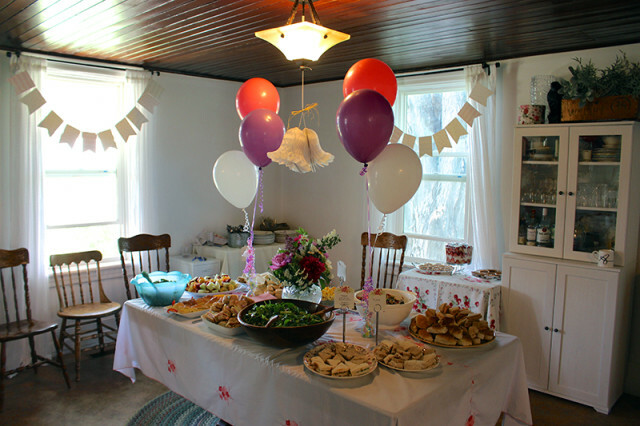 We used vintage linens for tablecloths and one of the aunts pulled together a whole collection of vintage plates and cutlery to use instead of paper or plastic. 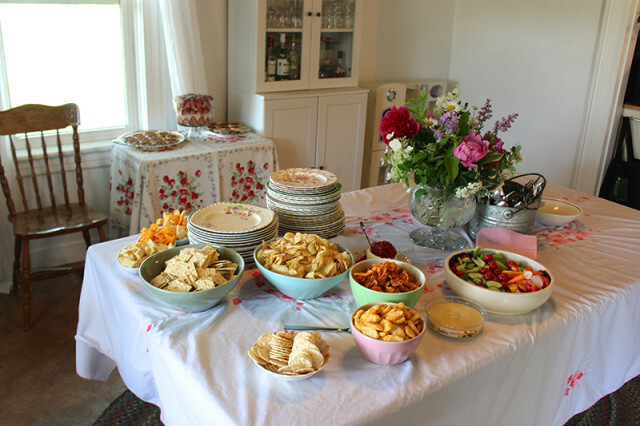 We started with little nibbles for when the guests arrived – cheese, crackers, dips, chips and fresh veggies. 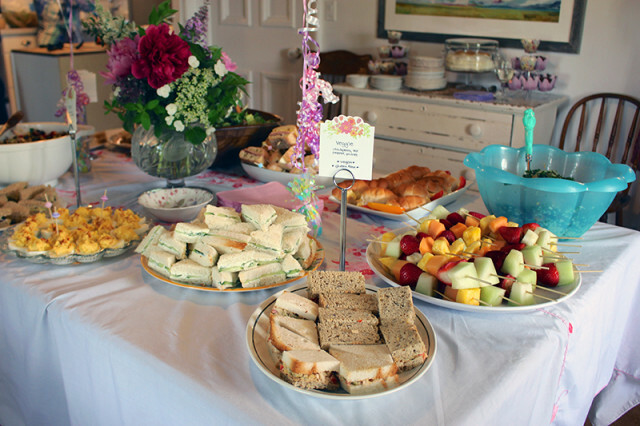 The luncheon was an array of tea sandwiches, with lots of vegetarian and gluten-free options too. We had salads, deviled eggs and fruit kabobs as well. The big floral arrangement in the middle of the table is a mix of Cloverhill Flowers and blooms from my mother’s garden. The foliage is from my raspberry bush out back! 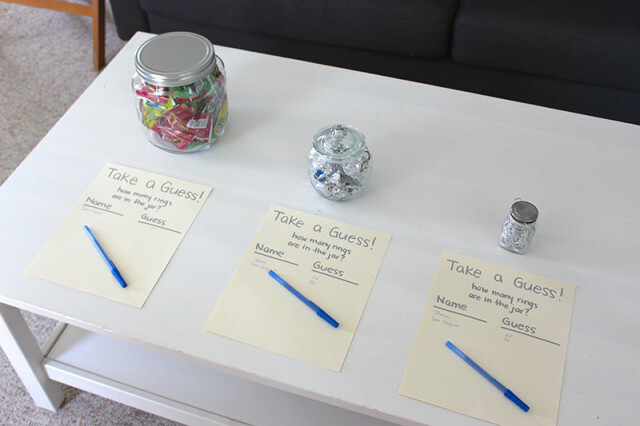 We kept the games simple, with things that guests could do at their own pace. 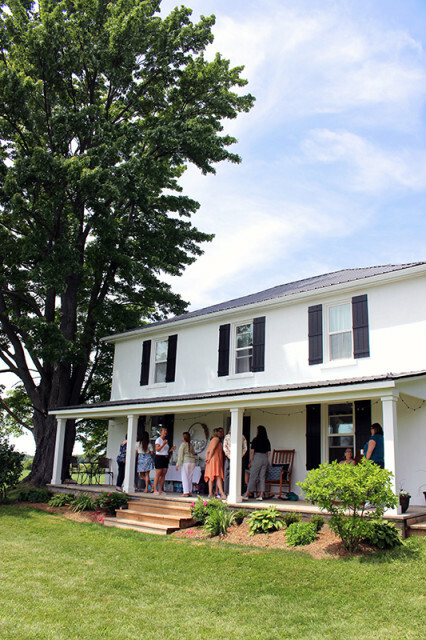 This fun version of the Newlyweds Game was a great conversation starter. A fellow cousin asked the groom some questions (things like “Who mops the floors?”, “Who pays the bills?”) and then had blue or pink sticker dots for guests to take a guess. Later in the party, the real answers were revealed to lots of laughter. 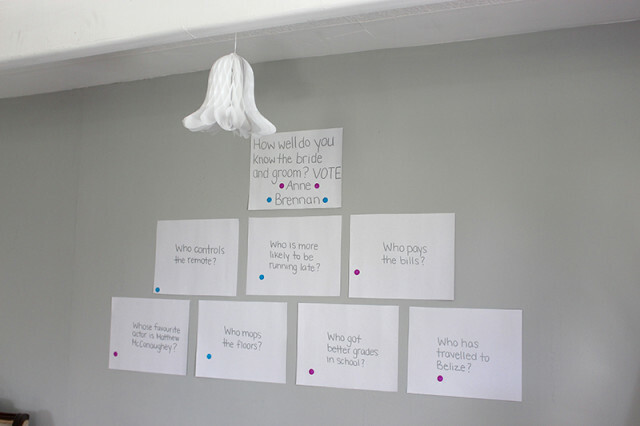 This is a game that my sister set up at my own bridal shower, and it is always one of my favourites. 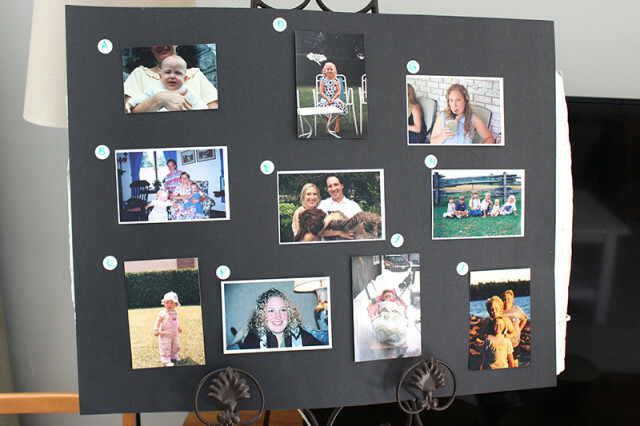 We gathered up pictures from over the years and guests had to guess what age the bride was in each picture. It’s always so cute to see those little chubby baby pictures! The last game was guessing how many rings were in each jar. The first was Ring Pops, the second was large costume jewelry rings and the last was full of tiny faux wedding bands. We announced the winners of the last two games during a break while the bride was unwrapping gifts. 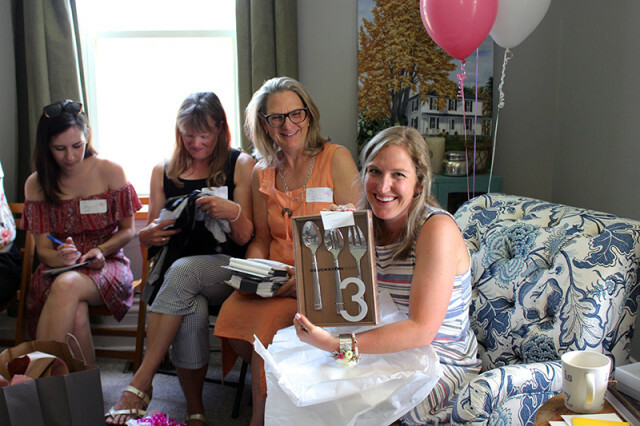 For more bridal shower games and simple prize ideas, check out this post. 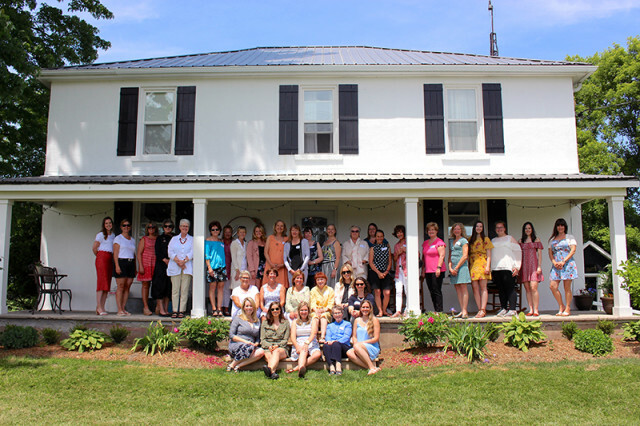 It was lovely to have so many women here to celebrate my cousin and her upcoming wedding. We almost filled the whole front porch! 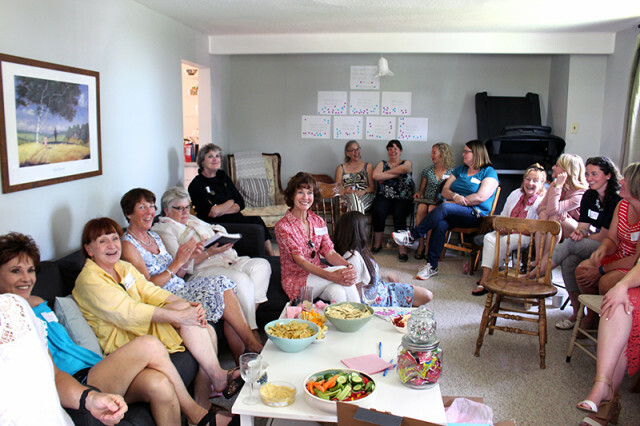 It was great to have the house full of ladies talking and laughing together. 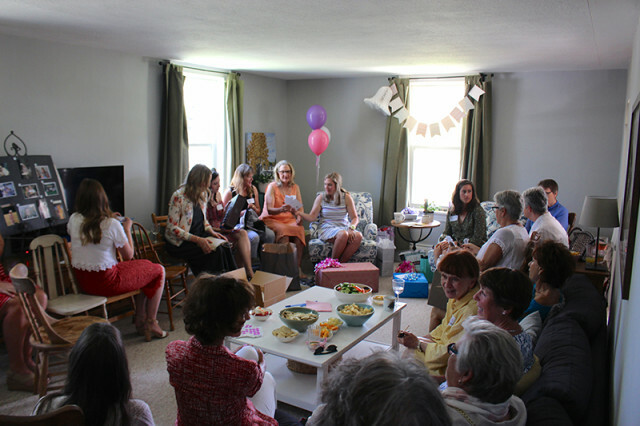 We somehow managed to squeeze all 34 women into our living room while the bride unwrapped gifts. 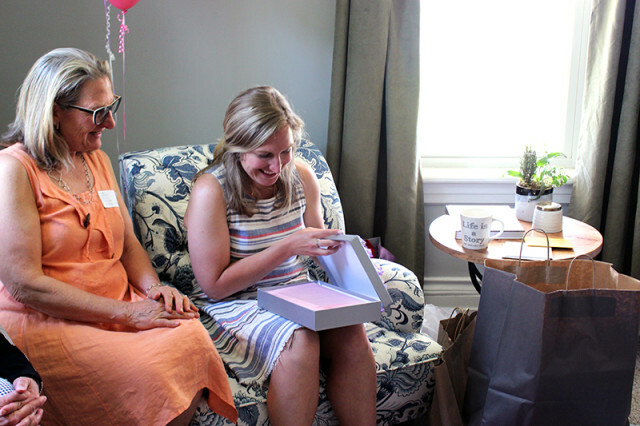 The first gift we gave her was one that I put together leading up to the shower – a bound cookbook with recipes from all the women who came to the shower (and those who weren’t able to make it too). 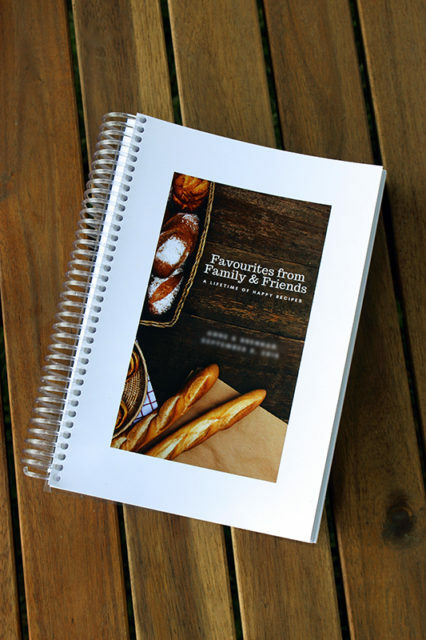 I shared a tutorial on How to Make Your Own Cookbook, with templates and my tips on how I compiled everything and formatted it for printing. Her reaction when she opened it up was priceless. 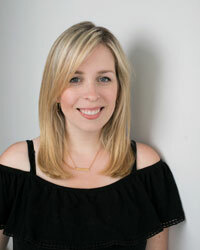 Everyone included why they’d chosen their recipe for her and all the well wishes for her in married life. My favourite part of making the book was getting so much inspiration for what to make in the kitchen. They all came up with different things that I would never have expected – a lovely mix of recipes. The bride continued to open gifts while us hosts set up a dessert buffet in the other room. 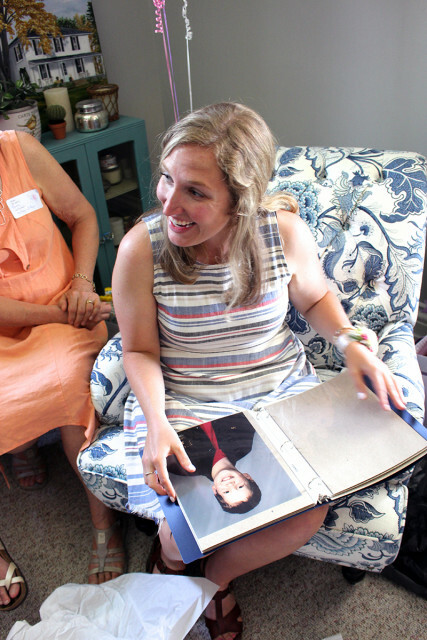 The last gift was a real gem too – the groom’s mother surprised the bride a photo album full of pictures of the groom from every year. We all had a good laugh at those awkward teenage years and lots of “awws” over his adorable baby pictures. After gifts, we ushered everyone into the dining room while the bride cut a cake and we served up dessert. I forgot to grab a picture of it, but we had a lovely mix of cupcakes, pumpkin tarts, lemon cake, trifle, fresh fruit and more. 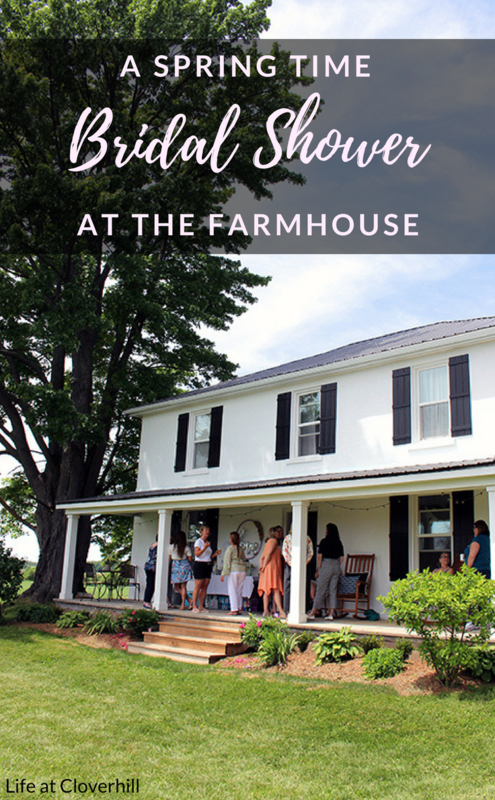 In the front hall, we set up a little table with a bridal shower favour for the guests to take home – homemade Lavender Sugar Scrub, using lavender that I dried from our flower field last summer. I shared a tutorial on how I made them (it was so easy!) and packaged them up for the guests. It was so much fun putting together this party and we had a blast celebrating such a special milestone for my cousin. 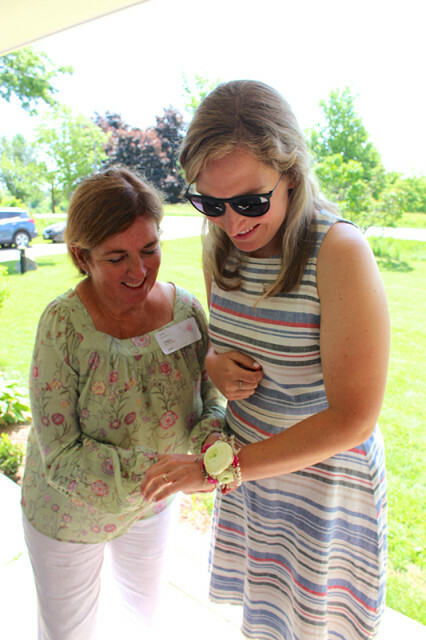 A warm thank you to all the ladies who came out and made this day memorable. For more wedding and shower inspiration, check out my Wedding section.